Paddy Jackson orchestrates big win in Wales to secure tie with Leinster. It was a good day for Ulster in Swansea. AN ALL-IRISH semi-final will see north meet east once again after Ulster secured fourth spot in the Guinness Pro12 thanks to a bonus-point win in Swansea, while Leinster demolished Treviso at the RDS to finish top of the tree. Paddy Jackson, Rory Best, Andrew Trimble, Chris Henry, Stuart Olding and Franco van der Merwe all got on the scoresheet in a thrilling end-to-end encounter where Jackson notched seven from eight kicks in a second imperious display in as many weeks. Connacht will face Glasgow Warriors in the other semi-final in a re-run of today’s fixture where the Western province ran out 14-7 victors in Galway. With Craig Gilroy’s return from illness marking the only change from the team which dispatched Leinster last weekend, Ulster rode their luck early on as Sam Underhill broke through on five minutes but picked the wrong pass, supplying the heavily-marked Dan Biggar rather than the unaccompanied Rhys Webb 10 metres from home. When Webb found Biggar off the back of a five-metre maul on 12 minutes, however, Ulster’s luck ran out – the out-half free to saunter between the posts for the simplest of tries, which he converted. Jackson soon matched his opposite number’s feat, picking up off Jared Payne’s diagonal run for a 16th-minute score and conversion after some phenomenally strong ball carrying from Iain Henderson. Next to shine was Best, collecting from Pienaar after muscular work from Trimble and weaving a route between three Welsh defenders to crash down just over the line as Josh Matavesi and James King teamed up in a vain attempt to bring the Ireland skipper to ground. Jackson converted again, but as Ospreys closed out the half in the ascendancy, Matavesi noticed and exploited a gap between Best and Callum Black 10 metres out for a smart solo try, enabling Biggar to restore parity with the extras. There was still drama to come before half-time, however, as Webb was left to rue the unpredictability of the bounce of the ball from Trimble’s up-and-under, the scrum-half wrong-footed as the ball spiraled away from him – and into Trimble’s grateful clutches for a 40-metre run-in to the line. More good fortune for Ulster saw Jackson’s conversion strike the right-hand post and fall just behind the crossbar with the final kick of the half. The Ulster out-half kept the momentum going early in the second half with a sweetly-struck penalty from distance, but a handful of missed tackles almost got the visitors in hot water on 53 minutes, as the Ospreys progressed to three metres from home before a hard-earned turnover from Pete Browne got them out of jail. The bonus point came two minutes later – and from a somewhat unexpected source as, after forcing their way to the opposite end of the park, Ulster contrived to lose possession in a ruck centimetres from the Ospreys try-line. However, as the ball rolled back to Webb, who steadied it with his studs, the quick-thinking Henry reached round the side to apply downward pressure just behind the line for a try confirmed by TMO Derek Bevan – despite a crescendo of jeers around the Liberty Stadium from partisan Welsh fans, suspicious of a knock-on. Unfazed, Jackson added the conversion and soon thereafter a penalty, and while recent entrant Grabham dove over in the corner on 65 minutes for the Ospreys, fellow replacement Stuart Olding put the result beyond any doubt three minutes later as his fleet footwork eluded four prospective tacklers for another try underneath the posts, converted to maintain Jackson’s 100% record. Another unpredictable bounce – the first of the match, perhaps, to go in the Welshmen’s favour – gifted Grabham his second try as this time Jackson was outfoxed in the corner and, although Biggar converted, Ulster closed the game on a high as lock van der Merwe waded his way through half-a-dozen Ospreys for the score with four minutes remaining. Ospreys: Dan Evans; Ben John, Owen Watkin, Josh Matavesi, Eli Walker; Dan Biggar, Rhys Webb; Nicky Smith, Scott Baldwin, Dimitri Arhip, Rynier Bernardo, Rory Thornton, Dan Lydiate, Sam Underhill, James King. Ulster: Jared Payne; Andrew Trimble, Luke Marshall, Stuart McCloskey, Craig Gilroy; Paddy Jackson, Ruan Pienaar; Callum Black, Rory Best (c), Ricky Lutton, Pete Browne, Franco van der Merwe, Iain Henderson, Chris Henry, Sean Reidy. Email “Ulster head for the semis after emphatic six-try demolition of Ospreys ”. 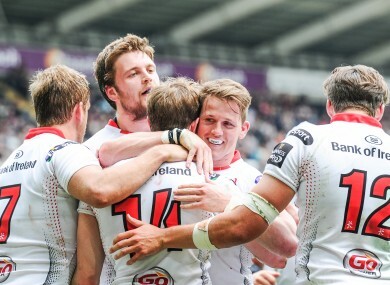 Feedback on “Ulster head for the semis after emphatic six-try demolition of Ospreys ”.